Shelf Swap. Like Wife Swap but better. You guys, I am checking in today with some earth shattering decorating. Prepare to be blown away. Are you sitting down for this? Well, yesterday I had an epiphany and it involved these bookshelves I stuck in the kitchen. Somehow having you guys look at everything on my shelves is making me feel really vulnerable. Yes, I own Twilight and Sisterhood of the Traveling Pants. Let’s just get that out in the open right now. I am a tween trapped in a 33 year old body. I blame my childhood. Also, my kids are huge slob kabobs who refuse to put away their craft supplies in an organized manner. And yes, those are three animal heads and a cotton candy maker on top. I have high standards when it comes to decor. Here’s an older zoomed out photo for layout context. And, again, yes, I don’t bother even cleaning dirty dishes off the table before posting pictures of my house on the internet. Classy. Speaking of slob kabobs, I’m pretty sure they learned it from me. Here’s the earth shattering part. I moved the shelves into her room. Yes, they are still shelves. No, I didn’t paint them. Yes, I’m using them for their intended purpose. Hmm, I suppose this wasn’t so earth shattering after all. Carry on. And I apologize for the big mooning from Mr American Girl pony. He’s so rude. Once the shelves were in I just wanted to get the room headed in the right direction so I brought in the dresser I bought for her at Salvation Army last month that has been sitting in my garage waiting for me to paint it and to fix 4 of the drawers (the sliders on the bottom of each drawer have come unattached. Easy fix but I’m lazy too busy being a mom to over-scheduled children). Hence the reason there are no drawers in said dresser. But it fits! And it looks good! Thank gosh considering I bought it on impulse without measuring anything. Finally, the room is starting to feel cohesive. I can breath easier now. One happy surprise is how the gray (Slate from Restoration Hardware) on the back of the shelves is bringing out the gray in the newly painted greige walls. Now I’m digging the SW Accessible Beige even more. Now that I have the shelves in place I really want to add some sconces to either the wall behind the bed, or on the sides of the shelves themselves. I guess you’ll just have to be in suspense until I pull the trigger on that. Also, artwork. This child of mine is an artist and has boxes of art, so she and I will probably put together a gallery wall of her creations. She is very excited about it. So I suppose in the end it wasn’t earth shattering news, but it is progress. 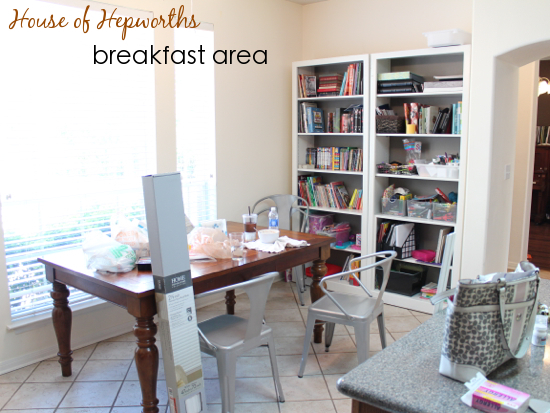 Sometimes I feel like blogging about my house is so trivial compared to real life, but it’s therapeutic for me and you seem to like reading it, so here it is. I have made progress on the house in general this summer, but nothing pretty, so I just keep avoiding blogging about it. But this is real life, and my real life is a mess, so hold tight and I’ll try to catch you up to speed on the progress of the fixer-upper; ugly photos and all. Bot your title, and your first paragraph cracked me up. Nice job – I love it. Such a simple, yet makes a big impact! No way Allison! One of the things I like most about your blog is that you keep it real! 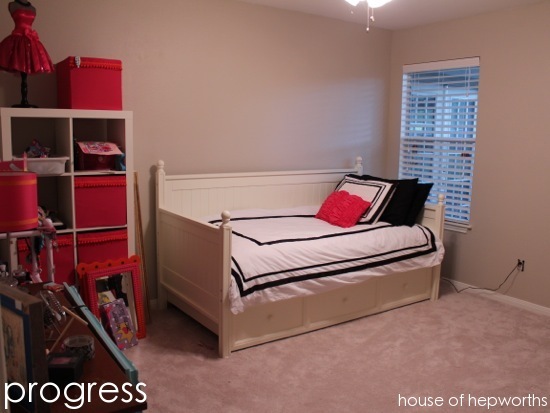 It’s great to surf the internet looking for inspiration to improve the home space, but it can be so disheartening to come across picture after picture and blog after blog of “perfect” rooms/homes and “perfect” families/lives/etc! I don’t want to look up from my screen and immediately want to give up since my own space is less than perfect and usually disorganized! So, thanks for keeping it real. Gotta celebrate the little victories too! Shelby, thanks! Sometimes I start getting insecure about posting not-perfect photos, so I appreciate the feedback. I’ll continue to keep it real! 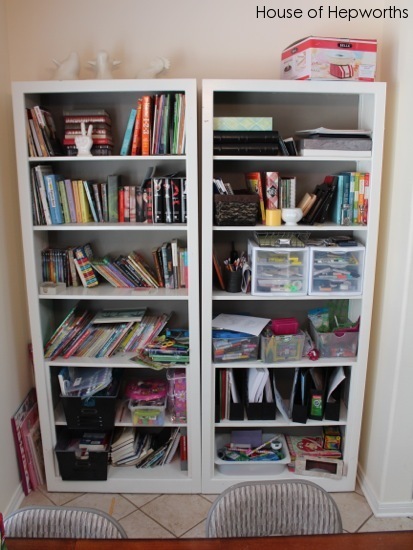 I love little revelations like that–like realizing you had the perfect spot for the shelves. they look good! 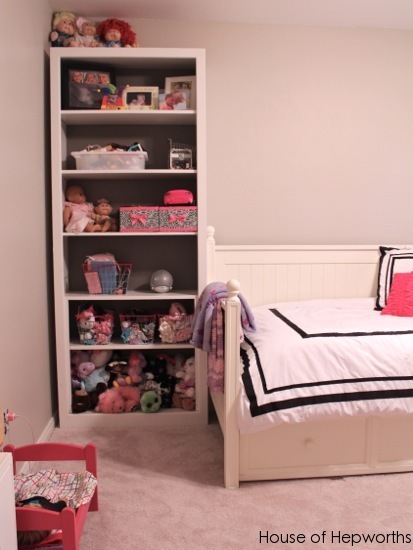 That was a very smart move to put those book shelves in her room. The space looks great now! Wow, what difference a shelf sway makes. So great that you were able to swap them out from another room. Love the ability to move, change and use what you already have. And yes kudos for keeping it real. So much more authentic. How about a crown molding on top of them and a little piece of wood on the front of each shelf to beef them up to look thicker? I know it would take a few hours, but I think totally worth it! It does look better with the bookshelves. Funny how a simple change can make a difference. Sending a link for a headboard that was done on a wall; seeing your pic, reminded me of it; wonder how something like that would look over the bed. Maybe you could consider buying some wood molding, etc., and finish out the space above the headboard so it looks like one massive pc of furniture. Inside you could have a shelving piece, etc. I definitely want to do this eventually. This looks good! I don’t take enough before pictures or in case of my kitchen, no before or after pictures. duh! usually if the kitchen (or any room) is good enough to photograph we’re having company and I don’t have time or I’m too tired. I should just give the camera to my daughter, like we did on our vacation. She and her bf took almost all the vacation photos. When you mentioned the horse I’m thinking..where where…and then I saw American Girl and I realized ..oh its a big horse and then I found it. lol Is the clothes form, her dresser, American Girl sized too? It’s so cute! I totally forgot to address this! Oops! I went to Walmart and purchased two cheap-o bookshelves for $29 each and put them up in the kitchen. This is a temporary fix but in the long run I really want to build out the area with a built in hutch. I like that your house looks real! Keep posting the little victories, that’s why I keep reading! I love Sisterhood of the Traveling pants, own both movies 🙂 And all of Twilight. So, you aren’t alone. These shelves look awesome in there 🙂 It’s like a perfect little puzzle…and kudos to you for measuring…that is something that I wouldn’t have done. I just would have crossed my fingers the whole time I was cursing and dragging those to the room hoping they would fit lol. Haha, you crack me up, Allison!! I am totally going to start using the term “slob kabob” lol! The book shelves look great — smart move! True dat about keeping it real. It’s so exciting to look at all these home blogs … for a while. Then totally depressing when they start to always look exactly like another magazine shot. I haven’t even looked at any home blogs for the past few weeks. Except Art of Doing Stuff. So, I just want to know, it kinda bothers me the way the right shelf is in front of the window. Does it impinge on the window space, or is it the photo? Maybe because I live in Seattle, I want every single window clear and free for perhaps a ray of sunshine…. This room looks so comfortable and bright and I really like how all the colors go together. But I guess that it takes quite a lot of time and efforts to bring everything to order, especially in a child`s room! And these shelves are a perfect match for this room. Are you going to be listing the ‘old’ bookshelf on CL? I’ve been checking for one daily 🙂 now that would be a real shelf swap! Yes! Do you want it? !